Guitarist and composer John 5 has worked with a varied range of artists. He has been a guitar player for some of the biggest headlining rock bands in the world, as well as playing sessions with Paul Stanley, Rod Stewart, Lynyrd Skynyrd and more. John 5 hangs with Rob Zombie and Marilyn Manson; scored Zombie’s film The Lords of Salem. His metal-glam appearance of a crypt keeper facade for John 5 is real, the subculture he projects is truly him, he is creative both on and off the stage, but more importantly, he can shred! That fact has allowed him to work with everyone from David Lee Roth to Meat Loaf to Paul Stanley to RED SQUARE BLACK to Lynyrd Skynyrd. Enter his new album called, It’s Alive, joined by the Creatures, which are, Ian Ross on bass and Logan Nix on drums, the trio delivers an all instrumental album of sixteen tracks that come from the band’s studio album, Seasons of the Witch, with some cover tunes added to round out the set. The styles include: metal, hard rock, funk, blues, southern rock, country and even a little bit of swing. In the vein of Joe Satriani, Yngwie Malmsteen, and Steve Vai, John 5 & The Creatures prove that shred is not dead, it is evolving to have personality, a wide range of virtuosic skills and a high level of accessibility for guitar freaks and casual music fans alike. That’s the short of it! 5 is a shredder, thank God, but the tunes on It’s Alive offer more than shredom, they are melodic and easy to follow and relate to, and the fact that 5 is serving up astonishing technical fret work is secondary to the overall statement of the tune! The result is both, invigorating and enjoyable! It sounds like the crowd noise within some of the tunes where enhanced, this could be for a number of reasons because of the way the show was recorded, but it does sound unnatural. Does it matter? No! The crowd sounds real in between the songs and while 5 is speaking to them, but I have to say I was surprised when I first heard the crowd sound within some tracks. Its an unneeded distraction. 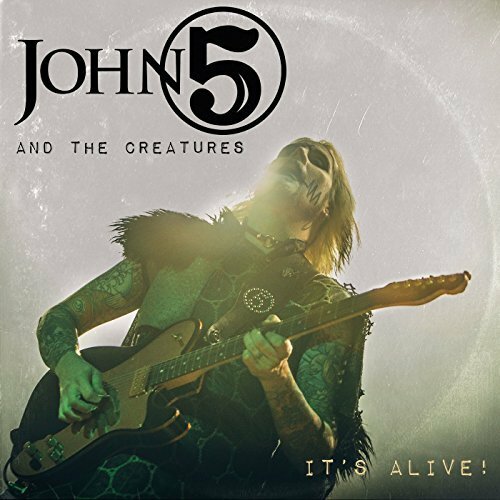 John 5 & The Creatures are taking rock instrumental music to a whole new level. This album is a welcomed listen and 5 will amaze you with the amount of sounds, personality and high-level accuracy he is able to effortlessly achieve in a live setting. The music is exciting and crowd-pleasing, both then and now, It’s Alive is fun, virtuosic, and most of all, MUSICAL!